UPDATE! I’ve moved into a new studio space, and I’m expanding the classes I’ll be teaching. If you’re interested in finding out more, please email me @ ted.nathanson@gmail.com OR through the comments on this page. Here you’ll find my upcoming schedule of art classes. Creativity in my lessons, built on a foundation of art fundamentals. Bellarmine University Summer Youth Camps Cartooning 7-11 thru 7-15 9am-noon. Kentucky Museum of Art And Craft @ Blackacre Nature Preserve. Comics/Nature. 7-25 thru 7-29. Speed Art Camp Narrative Art. 8-1 thru 8-5. 9am- noon daily. University of Louisville February 9. Guest Lecture, Graphic Memoir Class. Southside Elementary School. February 19, 22, 23. Painting Project. EXHIBIT @ Sunergos Coffee the Month of March! Mixed Media Afternoon Workshop. 3/12 . Speed Art Museum. APRIL is Louisville Cartoonist Society Month! Shows at Spot 5 Gallery, Rock/Art show at Skull Alley, and the release of the first Louisville Cartoonist Society Anthology! Tuesday April 6th. 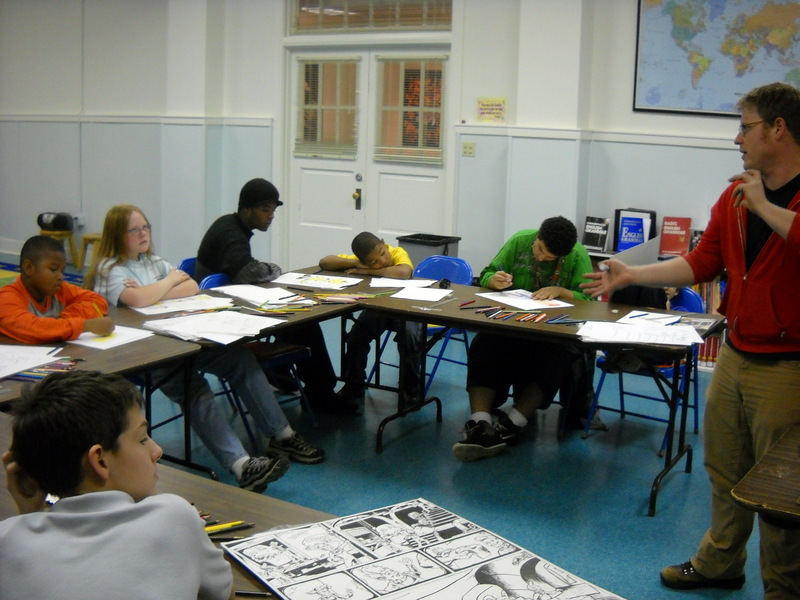 All day teen comic drawing class for the Kentucky School of Art. Comics! ages 9-13 Saturdays 10-11:30. 4/17 through 5-22. Preston Arts Center. May 23rd: Louisville Visual Art Association’s Buy Local First Fair. Art booth at the Watertower. 14th-18th 10-11:30 Drawing from the Inside Out. Preston Arts Center. 15th 2-3:00 COMICS Portland Library. 19th-23rd Kentucky School of Art. Narrative Book. 2-6th 10-11:30 Comics. Preston Arts Center. October 13th- Boyd County Library 6-7:30 PM- COMICS! October 29th- Bullitt County Library 6-8- COMICS! November 10th 3:00-4 Newburg Library- Comics! Congratulations on your new website!!! Very impressive resume!